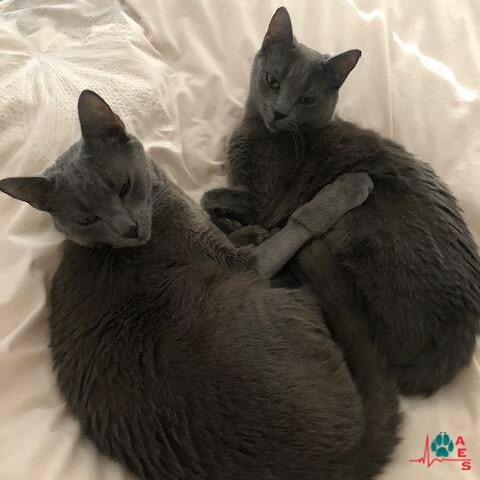 LJ, the 2-year-old Russian Blue, was rushed to the Animal Emergency Service Gold Coast hospital collapsing at home. The culprit? Earlier in the day, he had ingested a small piece of gladiolus flower – a toxic plant for cats. Many flowers can be toxic to cats if ingested: lilies, chrysanthemums, cyclamen, amaryllis, azalea and hydrangea (to name a few). Common clinical signs of intoxication include vomiting, diarrhoea, depression and neurological changes, hypersalivation (producing more saliva than is usual), irregular heartbeat and abdominal pain. If you notice any of these signs in your pet, contact your local vet for help immediately. Following examination and admission, LJ was administered IV fluids and admitted overnight for neurological monitoring and assessment. After a night of observation, LJ showed great signs of improvement returned home the next day, greeted by cuddles from fur-mummy Tia. “Thankfully LJ has made a full recovery and is back to his naughty little furry self and it’s thanks to you guys! I would like to thank everyone involved with his treatment from the 3 different vets involved to the nurses and the wonderful receptionists! The updates throughout the night were a welcome relief to staring at my roof wondering if my baby had made any progress. It’s a tough gig that you guys do and working in customer service myself I understand all too well how quick people are to react!